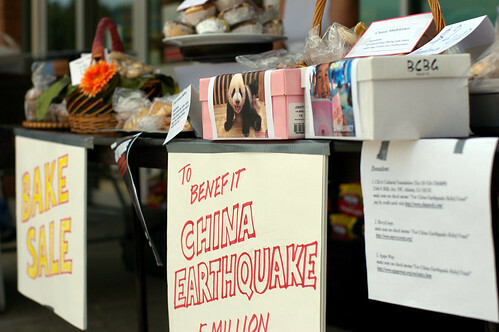 Two weeks ago, my friend Grace asked if I'd be interested to participate in a bake sale she organized to raise fund for the 5.12 China Earthquake. According to the official toll, this is the worst earthquake that struck China since the Tangshan earthquake in 1976. It has claimed 69,000 lifes, with more than 19,000 people still on the missing list. As for those who escaped, at least 5 millions in the region are left homeless after the quake and many more tremors that followed. Wanting to help even when none of us have any bake sale experience, we did what we could. Being the only Malaysian who worked alongside the rest of the oversea Chinese volunteers, I am deeply moved by the passion they showed. And the tales that some told, had allowed this stranger to have a glimpse into their lives that were shook and affected by the earthquake back home. There were bakers of all experience levels who contributed cookies, cakes, muffins, madeleines, brownies and other treats. One of the volunteers-Sheri, who is in her eight months pregnancy, baked more than 80 muffins for the event and had her husband brought them to the event. 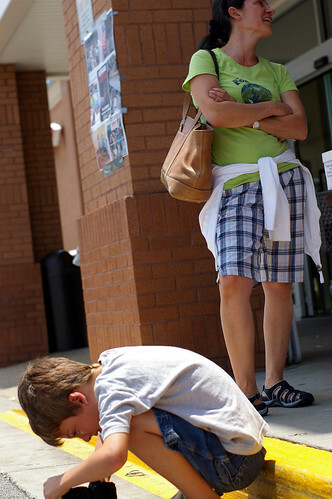 When the booth was first set up outside Kroger, I was apprehensive about the turn-out. "What if nobody wants to buy our stuff?" I asked Grace. My worry proved to be unfounded when many kind people dropped by to lend us their supports.Many of the patrons donated outright without taking anything so that we could raise more fund. Some bought our goodies, asking for no change. The generosity that the Atlanta residents showed is incredible, and I am touched in ways that I have never experienced before. 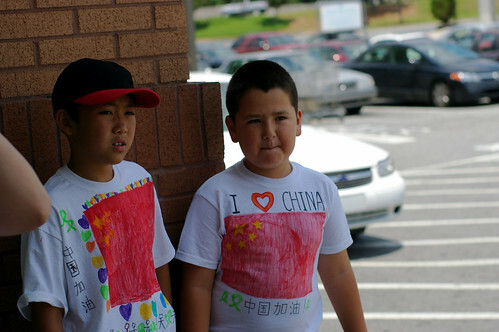 Most of us remember the young boy who came by with his mother, wanting to buy something to show his support. He insisted that he must pay with his money. Everyone looked on with interest when he digged deep into his waist pouch but couldn't find enough change. Sweets, gadgets tumbled out as he poured them out at the curb side under the noon sultry sun. We watched him took out the coins one by one, meticulously calculated to make up for 2 dollars. It may not be a lot of money, but the young boy had taught us an important lesson about giving. And kindness. 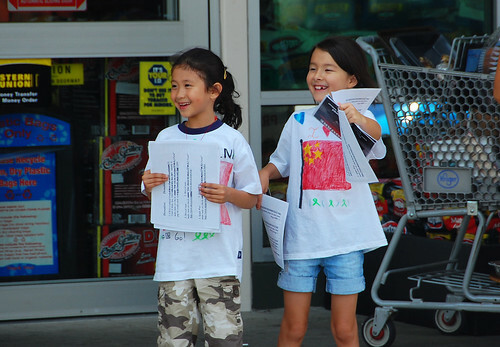 That afternoon, we also have four cute little helpers who help distributed the awareness fliers to the patrons. Having them around certainly helped draw in the crowd. It's amazing seeing people from all walks of life came through to help people whom they do not know, but suffered in a zillion miles away. In the end, we raised well over a thousand dollar. And Kroger has kindly agreed to match a certain percentage (to be determined after their internal meeting) of what we raised. 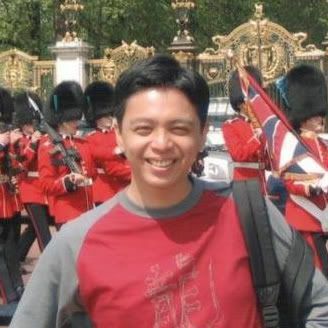 I am thankful to Grace who offered me the opportunity to help, and a chance to know the wonderful people whom I wouldn't have otherwise met. More of the photos can be found on my flickr and Grace's. Personally, I think this recipe is a keeper. The original recipe uses anise seed, but fennel seeds is an acceptable substitute which I have on hand, so that is what I used. Although I generally favor biscotti with chocolate, this recipe won my heart with the subtle but delicate flavor of fennel seeds and orange zest. With a generous 4 cups of almond used, the biscotti has an outrageous amount of nuts to dough ratio in every bite. I think I would use 2.5 cups to 3 cups of almonds when I make this again, it would still be a generous amount of almonds in the cookies. 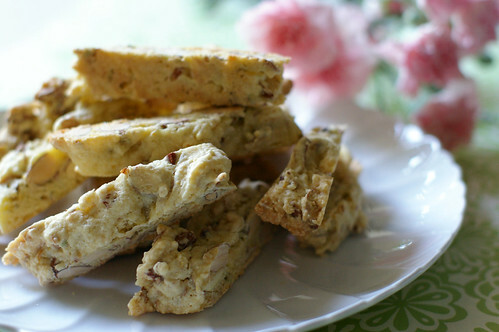 And as the rest of the biscotti recipes I favor, this one has no oil or butter in it. Perfect companion for the cup of coffee in the afternoon. Or anytime of the day, for that matter. Combine flour, baking powder and salt in a medium mixing bowl with a whisk. Using a sharp knife, coarsely chop the almonds and set them aside. In a bowl of an electric mixer, fitted with the paddle attachment, beat together eggs, egg yolks and sugar on medium speed until light, about 2 minutes. Beat in vanilla extract, fennel seeds and orange zest. Beat in the dry ingredients until the mixture is well combined. Remove the mixing bowl and stir in chopped nuts by hands. The dough will be very runny and soft at this point. Cover the bowl with plastic wrap and chill the dough for 2 hours, or until it's firm enough to handle. Preheat oven to 325F. Lightly grease two baking sheets with non-stick cooking spray or butter or line them with parchment paper. Divide dough into 5 equal portions. Using a spoon to scoop out the dough onto the baking sheet, shape dough into a log about 1.5 inches in diameter and 10 inches long. Place 2 of the logs on one baking sheet, 3 inches apart, and 3 of the logs on the second baking sheet, also 3 inches apart. In a small bowl, beat the eggwhite woth a fork until frothy. With a pastry brush, glaze each log with the beaten egg white and sprinkle with 1 teaspoon sugar. Bake the logs until they are lightly golden brown, firm to the touch and just beginning to crack slightly, 20-25 minutes. Rotate the sheet 180 degrees halfway through the baking time to ensure even browning. Allow the log to cool on baking sheets on a wire rack until they are cool to the touch, about 40 minutes. Reduce oven temperature to 200F. With a sharp, serrated knife, slice the cooled biscotti slightly on the bias into 1/4 inch wide slices. Lay the slices on the baking sheets in a single layer. Return them to the oven and bake for 20 minutes more, or until they are toasted, dry and crisp. Cool the biscotti completely on a wire rack. Store them in an airtight container, kept in a cool, dry place for up to 2 weeks. I like to keep some in the freezer to prolong their lifespan. Wow! More evidence of the great generosity of people :) You're just amazing, Mandy! And that boy who struggled finding money is being brought up really well. What a wonderful idea to raise money. I'll bet yours were among the better baked good items at the sale! bless u for doing this mandy! Wow, that's a great fundraiser! And the story about the little boy is so sweet. What a wonderful thing to do!! I should really follow your example. Mandy, that's a great way to raise funds. Lovely post, and such a nice story. Plus, a recipe! 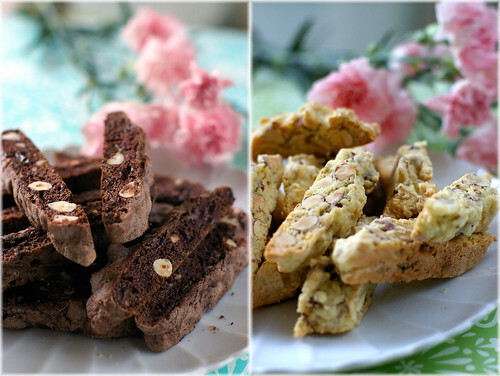 I love biscotti - I'll have to try those very soon. Well done, girl! It's a blessing to have benefit others with your talent. 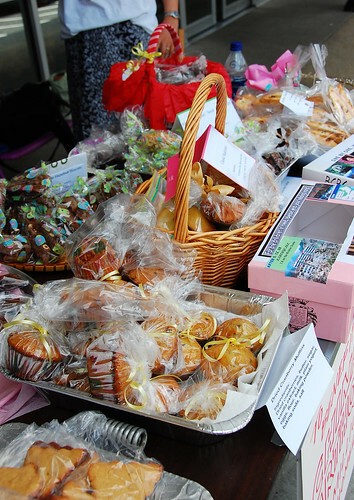 I loved bake sales as a kid...what a great memory you are giving them! The biscotti look great too! What a wonderful way to share with others in need, as well as giving others the opportunity to help by baking or buying. 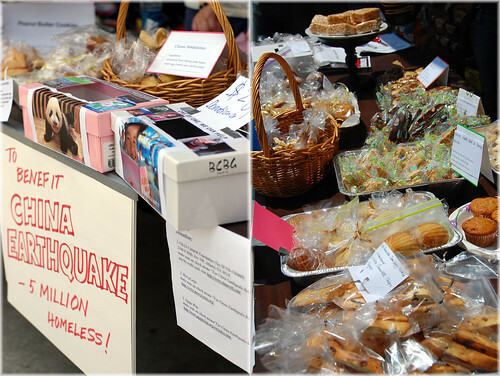 Great biscotti and the goodies at the bake sale look lovely. im proud of u mandy... keep up a gud work..